A recent move by the Western Australian Government to introduce a shark cull program has invoked public outcry globally. Under the program, the government has allocated more than $20 million over the next four years to “address public safety and help mitigate the risk sharks pose to water users.” The plan includes setting baited drum lines to catch large sharks along the shores of heavily-used beaches and hiring professional shark hunters to patrol these areas and kill large sharks >3m. So what caused the introduction of the shark cull program? Apparently a recent spike in the number of shark attacks in the region. More on this recent ‘spike’ later. In the meantime, DiveBuzz would like to share some key facts about why the shark cull is not an effective solution to beach safety. The status of all sharks and rays globally has been assessed as being at an overall high risk of extinction, with only one-third of species considered safe. Global populations of sharks are in decline with fishing (including shark finning) being the key factor in their decline. 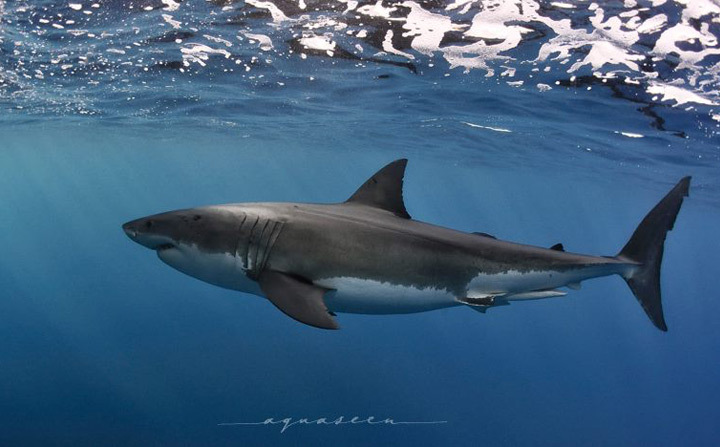 Being apex predators, these animals play a key ecological role in maintaining healthy oceans and decline and potential extinction can cause significant repercussions. A shark cull effectively makes a bad situation worse for shark populations and ecological balance. The shark cull in WA is targeting large species of sharks >3m. Animals >3m are likely reproductively mature animals. Removing such large animals from the population impacts the reproductive capability, in a direct contrast to 2010/2011 WA fisheries policy that protects breeding stock. Furthermore, to date, a number of sharks <3m have been killed in the program, already dead on the drum lines before drum line inspection has occurred. White sharks are listed as Vulnerable under the IUCN (International Union for the Conservation of Nature) Red List and protected in Australia because of their reproductive behaviour. White sharks are slow-growing and can live for over 70 years, reaching sexual maturity at 17 years. When they do reach sexual maturity they are around 4.8 metres in length (above the 3m size limit for culling). Consequently, white sharks reproduce very slowly, with females giving birth to between two and 10 very large pups every 2-3 years. This slow reproduction cycle makes white sharks very vulnerable to over-exploitation. Where data exists, most estimates suggest white sharks are decreasing. And while accurate estimates are difficult, genetic work suggest that there may be as few as 700 breeding individuals in southwestern Australia. Tiger sharks grow to approx. 4.5m and can live to 50 years. They are reproductively mature when 2.5-3.5m in length at 4-11 years of age. Tiger sharks produce relatively large litters, typically between 30 and 35 pups every 2 years. Although these relatively rapid rates of reproduction mean that tiger sharks are more resilient to exploitation than white sharks, they are listed as “Near Threatened” on the IUCN Redlist. This is largely due to commercial fishing and by-catch driven by finning for shark-fin soup. There is no science based proof that the culling of sharks will make beaches any safer. The only way culling will make beaches safer is if you cull all the sharks, and no one wants that. Alternative no-kill mitigation programs such as potential shark tagging programs where alarms sound at popular beaches when a large tagged shark is in the area, aerial patrols and public awareness about when not to swim to minimise risk have been dismissed. Why? We need to know more about sharks, their behaviour and their territory. You do not find this out by way of a cull. There is an opportunity to make a positive difference. Large “predatory” sharks such as white sharks, tiger sharks and bull sharks are the target of the shark cull program. So far, seventeen tiger sharks have been caught on drum lines and killed, according to the Department of Fisheries. Nine sharks have also been found dead on the drum lines. In total, 66 sharks have been caught – 23 in the south-west and 43 in the metropolitan area. 63 were tiger sharks, two were mako and one was a blacktip. No white sharks, the species responsible for the recent ‘spike’ in fatalities, have been caught possibly indicating just how vulnerable white shark numbers are? Also noteworthy is that white sharks are found in marine environments ranging from the tropics to cool temperate zones, tagging data shows that they undergo very long migrations across the open ocean and are unlikely to hang around popular beaches for any significant period of time. It’s not only target species that are impacted by the shark cull program. Drum lines may also catch other threatened shark species in the region, including “endangered” hammerhead sharks, “vulnerable” sandbar sharks, “vulnerable” dusky whalers and “near threatened” bronze whalers. The danger to these animals and undersize sharks lies in setting drum lines for extended periods of time. If the lines are not checked regularly, non-target wildlife may be dead on the line or seriously compromised, rather than being released as intended. The recent ‘spike’ is no more than an anomaly. There were 10 shark attacks in Australian waters in 2013 – the lowest annual total since 9 in 2008 and lower than the 12.3 average attacks per year during the past 10 years (2003-2012), according to shark incident file researchers at the University of Florida. The numbers are low and quite normal, there is no need to take knee-jerk, destructive actions. 7. Are drum lines any different to shark nets? Shark nets, which have been used for decades in NSW and Queensland, are just another shark culling strategy. So, in essence, drum lines are no different to shark nets – they are both intended to kill sharks found in the local area. We would argue to remove the shark nets as well, as they are responsible for killing even more non-targetted species, such as turtles, whales, dugongs, stingrays and dolphins. But one reason they are still used, in our opinion, is purely from a political standpoint. Simply put, no politician wants to be the one who removes the shark nets for fear of a shark ‘attack’ shortly afterwards. Political suicide. However unlikely it may be. The same applies to the drum lines. The longer the drum lines are left in place, the harder it will be to remove them, purely from a political standpoint. So what do we need to do? We need to implement non-lethal approaches that improve ocean safety such as tagging, beach alarms and better public awareness and behaviour. Divers who ‘collect’ on SCUBA and breath-hold spearfishermen are fully aware of the inherent risks involved in their sport. We need to educate the wider public to avoid swimming in certain locations at certain times of the day. Otherwise all we are doing is placing additional pressure on already threatened wildlife. The WA Government has launched a public consultation period which is open until 20 Feb. Please spend one minute of your time to submit your views. Click here to go to the link.